Day 1: Meeting in Chamonix, review gear, prepare the trek. Hotel. Day 2: From Chamonix, Transfer to Le Tour village, hike over Col de Balme, to Trient glacier and Col de la Forclas, via Les Petoules. A great first day leaving the busy valley de l’Arve and slowly getting into the rhythm of hiking. Lodging: Inn, Restaurant de la Forclas. Day 3: From Col de la Forclas, to Val D’Arpette and Relais D’Arpette.This second day is demanding but rewarded by amazing view. After hiking the Bisse we will climb along the Trient glacier to Fenetre d’Arpette. A total of 1’140m of vertical gain, then descend in the Val d’Arpette to the Relais. Lodging: Relais d’Arpette. Day 4: From Champex to Verbier and Louvie hut.Transfer from the Relais d’ Arpette to Verbier and Les Ruinettes (bus and gondola). 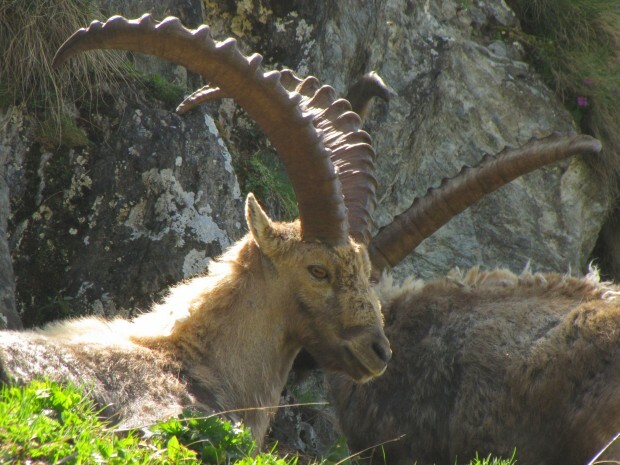 Hike over col de Ternin, to cabane de Louvie An amazing trail on the flank of the mountain were ibex and chamois live. Day 6: From Prafleuri Hut to Arolla. An early start will bring us at Col des Roux 40minutes above the hut for sunrise and views. After a descent, We will hike along the Grande Dixence lake to Pas du Chat, walking along the moraine and crossing the Cheilon Glacier. We will climb the ladders of Pas de Chevre and hike down to the beautiful alpine town of Arolla. Lodging: Hotel Des Glaciers. Day 7: From the quaint town of Arolla, we will transfer to Les Hauderes and Le Mayen de Cotter by bus. From the Mayen we will hike over Col du Torrent, descend to Lac des Autannes, soaking in as much of the view as possible since this is one of the most incredible views of the Moiry glacier, Grand Cornier and Pointe de Mourty. We will continue the descent to the Barrage de Moiry. Then Transfering to St Luc, ride the Tignousa funicular and hike the planetarium trail to a true English style hotel from the last century (1889), get ready for unforgettable experience. Day 8: From the hotel Weisshorn, to Gruben, Turtmental.We will hike to Chalet Blanc were we turn right towards Meidenpass. Now we will approach Zermatt and the hearth of the Alps with breathtaking views. A long descend follows to Gruben, in a forest of “Melezes”. Lodging:Hotel Schwarzhorn.